Your move may require the transport of delicate, sensitive and/or misshaped items that are difficult -- even dangerous -- to move without professional help. To alleviate this concern, Mid Cal's residential and commercial clients rely on the expertise of our Stockton specialized movers. These trained and certified professionals can safely and efficiently move your most difficult items. Furthermore, as agents for Bekins Van Lines, we can even transport your belongings around the globe to more than 100 countries overseas! 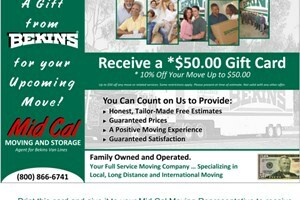 For more information on our specialized movers in Stockton and the comprehensive services they can provide, call us today or fill out the Quick Quote form above for your no obligation estimate.